Exercising and taking care of your body is not a trend anymore, it’s a lifestyle. 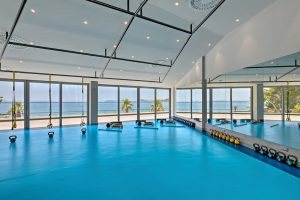 That is the reason why Le Méridien Lav has reconstructed its Fitness centre. We want you to experience modern and efficient exercising programmes designed to improve your physical and mental health. Everybody who wants to redefine physical appearance but also acquire all the necessary knowledge on how to take care of its body can find something in our offer. We have group and individual classes. 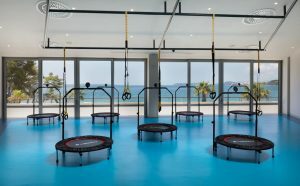 TRAMPOLIN CLASS (a unique training program in Split and its surroundings). Training that develops strength, endurance, flexibility, balance, and coordination. All muscle groups work together. The class uses body weight, gravity force (for beginners) and various props (for advanced exercisers). Exercises can be dynamic, static or both. This training develops motor and functional abilities, reduces fat tissue and increases muscle mass. Functional training enables you to simply perform everyday activities, reduce the risk of injury and consequently, significantly improves the quality of life! In this class, all exercises are performed very lightly without any sudden movements. Pilates is not “easier” to perform than other popular forms of exercise since it is an isometric exercise requiring endurance. The volume of muscles is not going to increase, muscles rather become elastic and flexible. This form of exercise aims to develop flexibility, good posture, strength and balance. Intended for people who simply want to improve their health. A unique training program enabling you to improve your fitness/conditioning, burn excess fat, strengthen ligaments, joints and body muscles. Besides the trampoline, the class uses several different props to make the exercises more interesting and useful. It is possible to burn 405 calories in 30 minutes. 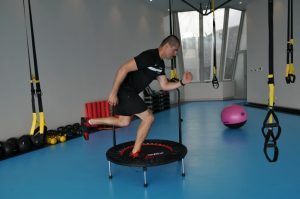 NASA’s findings have proved that trampoline class is 68 % more effective than running.